Sopladora con mochila, sin escobillas, de 40V está calificado 4.5 de 5 por 16. Calificado 5 de 5 por PicRic de Superior Blower that Delivers a Real Punch Superior blower that delivers a real punch with less noise than other blowers. I measured 5 to 7 decibels quieter than my handheld battery operated blower. A small but noticeable difference. In use the blower works very well. The trigger controls the variable speed throttle and the cruise control can be set to save wear and tear on ones’ finger. The Turbo Boost function is excellent and really gets those hard to shift leaves flying. The joystick type control can be moved forwards, backwards and turned left to right to ensure a comfortable fit for any arm and hand. The huge 40-Volt Lithium-Ion 5Ah (Amp hour) battery took almost four hours to fully charge and I estimate that will provide 30 minutes or so run time the way I use it. The provision to add a second battery is a good idea. Calificado 4 de 5 por swampgenius1 de Surprisingly good performance. 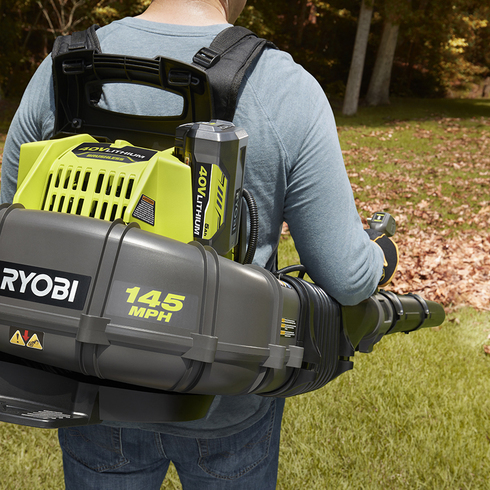 Bought this to replace my Ryobi gas powered backpack blower that has been nothing but trouble. Carb issues in less than a year. However, I have been pleasantly surprised by the power of this unit especially on Turbo setting. Really quiet and gets the job done. I would give it 5 star if it had a longer run time. Even with the second battery (which I have from my Ryobi lawn mower), it has a fairly short life. Cannot imagine this being useful for professional purposes,(unless you have a stash of batteries) but for putzing around the house and yard, it is adequate. Calificado 5 de 5 por cstanton35 de Great Power Less Noise This blower is perfect for small jobs as battery life is only about 30-45 mins depending on speed level you run it at. But has good power to blow stubborn wet leaves right away. Runs much more quite that gas powered equipment and without the mess of mixing fuel and oil. Controls are very easy to use and doesn't tire your hand or fingers. Backpack straps are adjustable so you can customize them to fit nicely. Much lighter than gas power at only approx. 10lbs. I would suggest that if you are going to run longer than the time mentioned above to invest in a second battery as the battery take about 2 hours to charge. I do also like how the battery has a LED indicator on it to measure battery life. Overall great for electric. Calificado 4 de 5 por SWBULLARD de NEAT BLOWER The Blower is great only a little awkward at first, my only complaint was the instructions for mounting the bellows, i went to the home depot website and the instructional video was great. 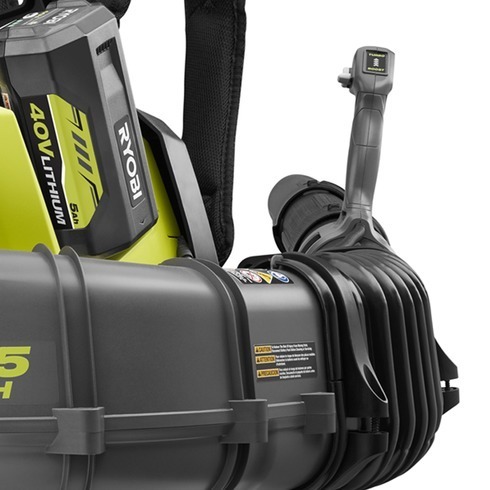 Just for the record I have several ryobi 40 volt tools and a great deal of the 18 volt and like them all. Calificado 5 de 5 por cdkelley de Game Changer I've had the 40V line for several years now. The blower was the only item I was still powering with gas. When I saw there was a backpack solution, it was a no brainer. Beyond power, the most surprising element is how quiet the unit is. With a 10 month old in the household, this blower is a dream. I can now quickly blow off the deck or driveway without a worry of waking the baby. Increíblemente potente. Increíblemente silenciosa. 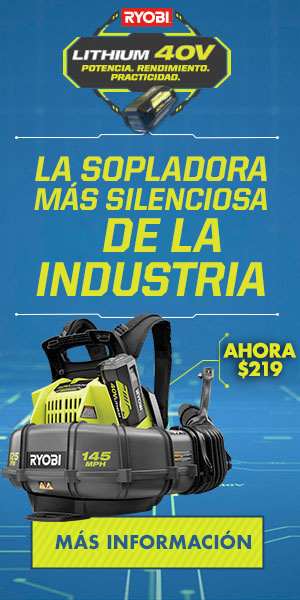 La sopladora con mochila 40V con CROSSFORCE FAN TECHNOLOGY™, un diseño único de entrada doble, es la sopladora más silenciosa de la industria. Con su motor sin escobillas y batería de iones de litio, genera 625 pcm de fuerza de limpieza. Disfrute de la comodidad y la asistencia sin importar cuánto tiempo trabaje, con las tiras ajustables en los hombros y el diseño de espalda contorneada. 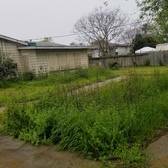 Esta temporada elimine en silencio todas las hojas con más comodidad y más potencia. Con solo 59 dB, esta sopladora tiene una potencia que tendrá que ver para creerlo. Sin vibración del motor ni ruido fuerte, esta sopladora redefinirá su percepción de potencia. Con CROSSFORCE FAN TECHNOLOGY, un diseño único de doble entrada, esta sopladora puede generar más potencia con mayor eficiencia y menos ruido. Eso se traduce en 625 PCM de potencia de limpieza, hasta 30 minutos de funcionamiento y 59 dB en su configuración máxima. 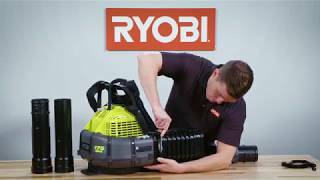 La batería de alta capacidad iones de litio de 40 V y 5 Ah ofrece un funcionamiento extendido y puede alimentar a todas las herramientas de 40 V de RYOBI. Con dos puertos de baterías activas, agrega una segunda batería 40V RYOBI para aumentar el tiempo de funcionamiento. El gatillo de velocidad variable ofrece un control total, lo que le permitirá eliminar residuos en áreas de plantas delicadas o soplar grandes pilas de hojas. Con el control de crucero, encuentre y fije la potencia perfecta para un trabajo. Cuando necesite más potencia, presione el botón turbo para tener 2 minutos de 625 pcm de potencia de limpieza.